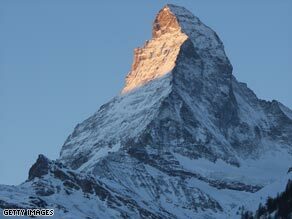 ROME, Italy (CNN) -- Melting glaciers in the Alps may prompt Italy and Switzerland to redraw their borders near the Matterhorn, according to parliamentary draft legislation being readied in Rome. Glaciers in the Alps near the Matterhorn are receding, forcing the border to be redrawn. Franco Narducci of Italy's opposition Democratic Party is preparing a bill to redefine the frontier with neighboring Switzerland, his office said Wednesday. Narducci is a member of the foreign affairs panel in Italy's lower Chamber of Deputies. Foreign Minister Franco Frattini has authorized the bill. Switzerland also has cooperated with Italy on the matter. The Italian Military Geographic Institute says climate change is responsible for the Alpine glaciers melting. "This draft law is born out the necessity to revise and verify the frontiers given the changes in climate and atmosphere," Narducci said. "The 1941 convention between Italy and Switzerland established as criteria [for border revisions] the ridge [crest] of the glaciers. Following the withdrawal of the glaciers in the Alps, a new criterion has been proposed so that the new border coincides with the rock." The border change only affects uninhabited mountaintop terrain. The deputy excludes the possibility of any family having to change citizenship. The border between Italy and Switzerland was fixed 1861, when Italy became a nation, but it has been occasionally modified, the Military Geographic Institute said. The border was last modified in the 1970s when the Switzerland-Italy highway was built at the Brogeda crossing. The bill is expected to become law by the end of April, Narducci said. Unlike Switzerland, Italy can change its border only with new laws approved by parliament. "Once upon a time, the border line demarcation between two nations was synonymous to war and bloodshed," he said. "Instead , today we proceed with photograms."